We hold Vamadeva in the very highest regards as a great thinker, writer and yogi. 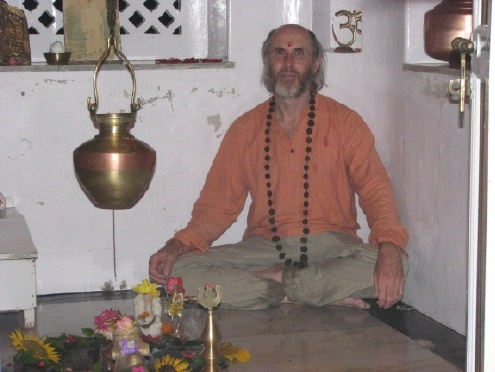 His books constitute the perhaps the finest literature on Hindu dharma in the English language. It was very heartening to read Vamadeva and Yogini Shambhavi’s message on Narendra Modi’s ascension to Prime Ministership of India, which is reproduced below from their website Vedanet. Nitya Sanatana Dharma Ki Jai! Ma Durga is preparing to place her Shakti in Delhi and throughout India once more after centuries of misrule! We congratulate Sri Narendra Modi for his brilliant and extraordinary victory in India’s national elections and his upcoming role as the new Prime Minister of the country. India can now rise up and once more reclaim its true role as the guru of all nations, sharing the spiritual and material abundance of the eternal Dharma with all. We encourage everyone and all our Vedic students to join in this epoch making endeavor in whatever way possible. The wishes of the great gurus of modern India – Sri Aurobindo, Swami Vivekananda, and Kavyakantha Ganapati Muni among many – can now become a reality if we dedicate ourselves to the cause of the Vedic knowledge for the benefit of the entire planet. May the voice of the Rishis be heard once more throughout the world!